Back in August last year I posted a review of some classic British biscuit cutters and promised you the recipe for the bourbon biscuits I made using them. Well never let it be said that I don’t fulfil my promises – if somewhat dreckly. If you don’t know what dreckly means, you clearly haven’t been to Cornwall. They may be a bit late, but here follows the afore mentioned recipe. Bourbons are one of my favourite shop bought biscuits, they are chocolate flavoured, have a filling, are cheap and definitely tasty. They’ve also been around since 1910 and although my mother never bought them when I was young, I used to snaffle the odd one here and there when visiting friends and family; I thought them the hight of sophistication. Of course, I don’t buy them very often now either, as I doubt there’s a single nutritious ingredient included. Introduced by Peak Frean over a century ago and for some reason named after the French royal house of Bourbon, they are the fifth most popular biscuit in the UK. The biscuit recipe I adapted, was from one of my favourite books, Homemade Memories by Kate Doran, baking blogger at The Little Loaf. She deftly uses bourbon in the buttercream filling and calls them Real Bourbon Biscuits. I didn’t have any bourbon, so I used a wee dram of whisky instead. I also used a drop in the actual biscuit dough. This gave the rich chocolatey bourbon biscuits an added depth of flavour that lifts them up a level, virtually eye-to-eye with Ben Nevis in fact. Classic British Bourbon biscuits, but with a wee dram of whisky added for a touch of sophistication & added depth of flavour. Perfect party fare. Cream the butter and sugar together until light and fluffy, then beat in the golden syrup. Sift in the dry ingredients and stir until everything is combined. Stir in the whisky then add the water a little at a time until you have the right consistency for a rollable dough. Roll out the dough to about 3mm in thickness. Then either stamp out the dough using a Bourbon biscuit cutter or cut into rectangles of about 6 x 3 cm. If you don't have a cutter, use a tooth pick to create 5 holes down each side of the rectangles. Transfer to lined baking trays and bake at 175C for about ten minutes or until the biscuits look done. Leave to cool for a couple of minutes, then transfer to a wire rack to cool completely. Cream the butter a little then add the icing sugar and cocoa bit by bit, beating as you go util you have a light whipped consistency. Beat in the whisky and vanilla extract. Spread the filling on half of the biscuits and press the other half on top. I’m sending these Bourbon biscuits off to Cakeyboi and The Baking Explorer for Treat Petite where the theme this month is favourite sweets, chocolates and biscuits. They also go to Bake of the Week with Casa Costella and Maison Cupcake. These look awesome and definitely for the grown-ups – putting the whisky in makes the perfect excuse for hiding them from the kids! Bourbon Biscuits were my absolute favourite before going gluten free. I was thinking about them last night and this reminds me that at some point I must put my recipe on the blog. Well yes exactly Vicky 😉 Do put your recipe up, I expect a gluten free version would be really popular. I heard that there was a bourbon biscuit shortage, so you posted these at the right time. One of my favourite biscuits and they dunk so well too. I heard something about the shortage too, hmmm wonder why. I have been known to lose most of a bourbon when dunking – oops! Now that would be something Becca. Maybe we should give them the idea. Grown up biscuits! How fabulous! I’m totally over excited by the cutters too – I need them in my life! My 10 year old is a total Bourbon Biscuit addict (I’ll have to make two batches, one for him and one with that little kick for me!) We’ve been missing them since the floods closed the biscuit factory! The cutters are fab Chris, although I’ve still not used the ones for custard creams, party rings and jammy dodgers. I’ve only just cottoned on to the factory closing. Sounds like you need to whip up a batch (or two) quickly. These look delicious! for our baking club this month we have to bring in a British bake so I will be having a go at these and the custard creams! Oh yes Claire, they would be perfect for this. Do let me know how you got on. Ah yes, reckon you could Tracey. Would he approve though? I quite like chocolate bourbons even though I can’t say I have had them often (when I land in the UK I have to eat chocolate digestives – so have eaten my fair share of them lately). And I can just imagine how superior yours are to the shop bought version. They even look every bit if more gorgeous! Glad you finally shared them. Ah thanks Johanna. Can’t you get chocolate digestives in Melbourne? Bourbons are a favourite of mine, although I am, of course, partial to a chocolate digestive or two. Are you home from your travels now? Only the 5th most popular? I thought for sure they’d have been higher up? 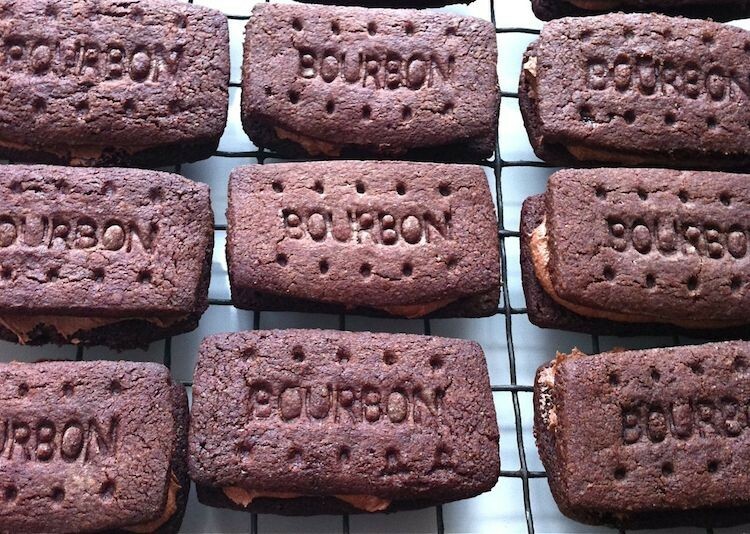 Either way I like the idea of using actual bourbon in a bourbon biscuit! Or whiskey – I, like you, have whiskey to hand! I’ve never eaten a Bourbon biscuit, let alone made one – they do sound fab. And those biscuit cutters are amazing, I definitely want some of those! Well I’m not sure I can think of a single NZ biscuit, despite spending six months there. Try a homemade one, they’re heaps better than bought ones anyway. The stamps are fab. I’ve not had a Bourbon biscuit for many years, they really were one of my favourites alongside Custard Creams and Nice biscuits. Your version sound amazing with the inclusion of whisky – which type did you use, I guess it wasn’t one of the very strong ‘peaty’ ones. Haha Angela, I guess you haven’t spent a great deal of time in Cornwall. I’d forgotten all about Nice biscuits until you mentioned them. My aunt used to make a really good creamy dessert with them. The whisky I used was a fairly cheap blended one, so no not one of the strong malt whiskies. Now how professional are they! And especially love the addition of the ‘wee dram’….. Thank you. I was slightly impressed myself, although it is of course all down to the stamp. These look even better than the real thing and so appropriate when there’s been a shortage of Bourbon biscuits recently!! Thanks for joining in with #BAKEoftheWEEK – round up and new week’s linky is now live on my site. Great, thanks Sarah. Who would have thought we’d have a UK biscuit shortage – quite shocking! These look fantastic! I’m off to check out these biscuit cutters now as I think I need to add them to my (somewhat embarrassingly massive!) biscuit cutter collection. Haha Jo. I think we need to see more biscuits on your blog to demonstrate your massive collection. I love Bourbon biscuits and am now the proud owner of 4 traditional biscuit cutters/stamps. Great that you’ve incorporated wholemeal flour into the recipe. As we have children I’ll leave out the tipple, but I’m definitely going to give these a gi. Thanks for a great recipe. Sammie. Ah you have the cutters Sammie. I look forward to seeing some classic British biscuits on your blog. You can use milk or water instead of the whisky. Well done, Choclette. These cookies look way to cool! I love these homemade Bourbon biscuits! Certainly an improvement on the shop bought ones! Thanks for entering into Treat Petite. Thanks Kat, I was really pleased with them and they tasted fab.